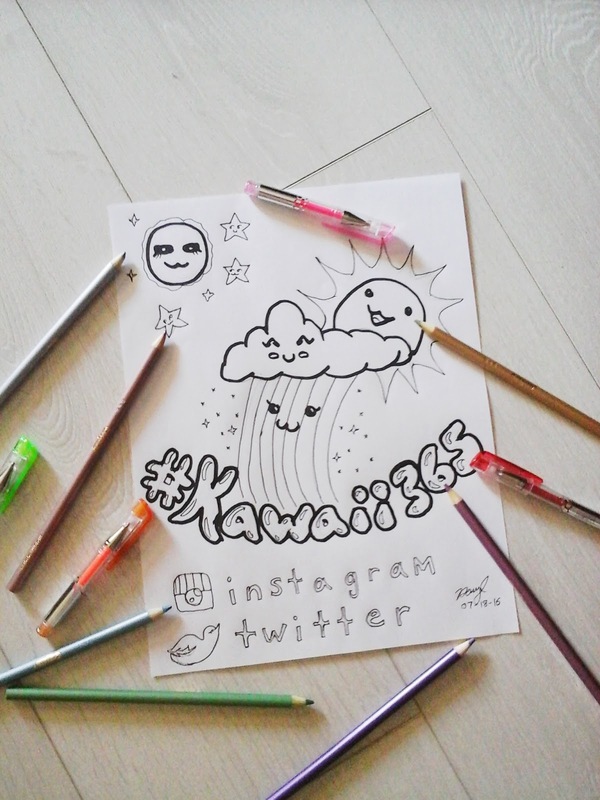 Daryl Januszewski in Red Deer, Alberta, Canada is creating daily in her #Kawaii365 project! She explains, "Each day, I draw a simple Japanese cartoon-style face on something random, or I make one of out craft supplies and leave it in a public place to be found and documented by the finder. I want others to stop and smile, and take a moment out of an otherwise hectic day. It feels good to see people light up." Why did you decide to do this project? I decided to do this project because I feel all this pent up creative energy inside my soul, waiting to get out. 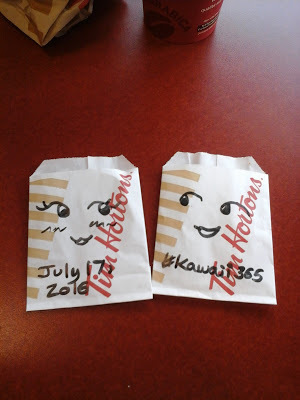 I have loved doodling smileys on things since I was a toddler, but as a pre-teen I fell in love with Japanese cartoons like Sailor Moon and developed an interest in anime and manga. How has doing a yearlong/daily project affected your life? Though I've only been doing this for a month, I am already excited about the next 11 ahead. I have become more confident and more apt to talk to strangers in malls and coffee shops about this and share little gifts with them. I have become a more open-minded thinker as well, doing things I wouldn't have thought of before (like creating a digital kawaii face out of symbols, or making 'pillows' with faces out of paper towels). See all of Daryl's projects HERE. Why did you decide to do this project? 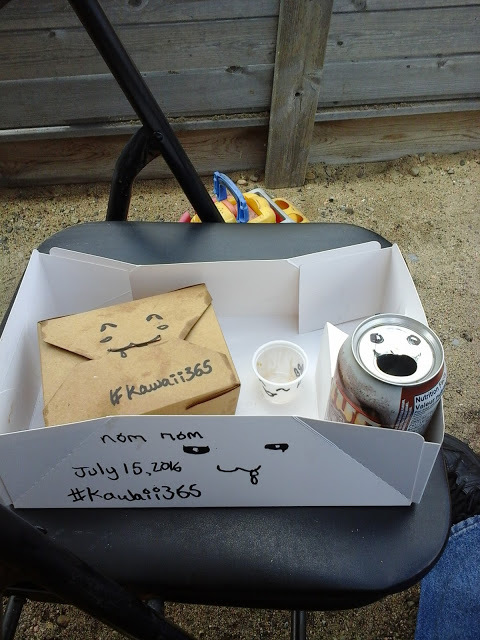 I decided to do this project after reading an article in the Washington Post Magazine about people doing 356-day projects and finding the Make Something 356 blog soon after that. I’ve done other creative challenges like NaNoWriMo and knitting 14 pairs of mittens for 2014 (it’s harder than it sounds) before, so I thought it would be interesting to do a year long project that was different from my normal creative work as a graphic designer. I picked origami because I don't have any prior experience folding paper. There are hundreds of models and crease patterns from the traditional to abstract available, so I knew I wouldn’t get bored folding origami either. How has doing a yearlong/daily project affected your life? 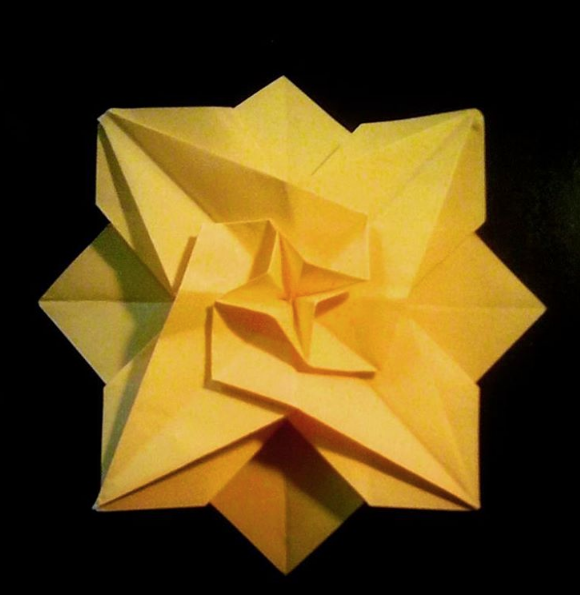 Folding origami every day has taught me to deal with frustration better. 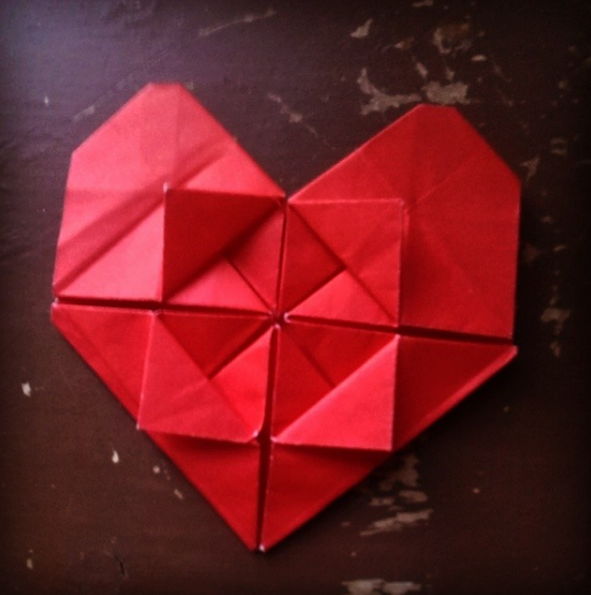 It takes patience and a steady hand to fold origami, so I have learned to stay calm and not tear the paper. 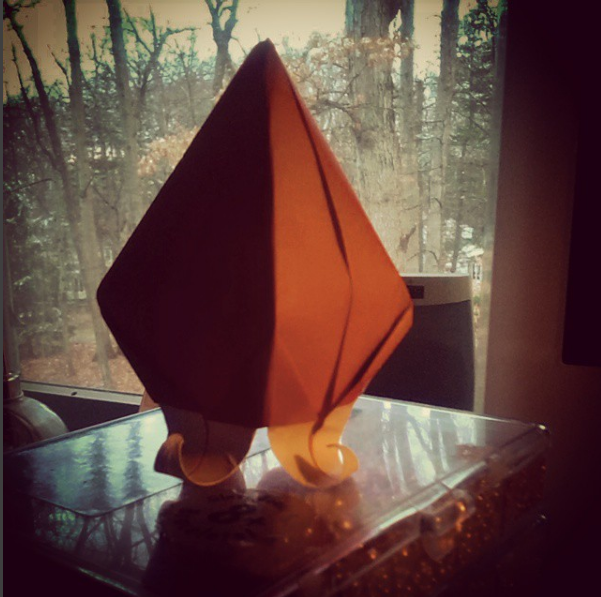 Even simple models have to be folded precisely. I’m also learning how to take better photos. See all of Ruth's origami HERE. Why did you decide to do this project? I had heard of (and purchased the book) 365: A daily Creativity Journal and also found out from another arts practitioner/lecturer – Nick Pearson – about the "tradition" and that he himself had done something similar some years ago. How has doing a yearlong/daily project affected your life? As an adjunct to the daily photograph I have included other events which have enriched my life – when I look at the video/photos I'm surprised how they bring back a story from each picture. Sometimes I have felt "oh there's nothing today" and then a great opportunity has appeared in front of me. This example is a favourite at present. I have had strong encouragement particularly from John Bradford who has told me how it has made him observe things more and helped inspire him to blog on "Creativity". Others I have shown the project to have been enthused and suggested images. I am planning to document the project and create some written pieces about "red". This project will also include a projected show in a local Pop Up Shop (first event August 1st to 14th) and more interaction with the public via BEAT (a local West London arts initiative) project in September. The project will end in November with another period in the Pop up shop. See all of Tim's red findings HERE. Anne Moss Rogers is Richmond, Virginia is creating The #griefheart project. Why did you decide to do this project? On April 11, 2016, I started posting a heart a day to help me heal on my grief journey since my son Charles’ suicide June 5, 2015. He was 20. The purpose? 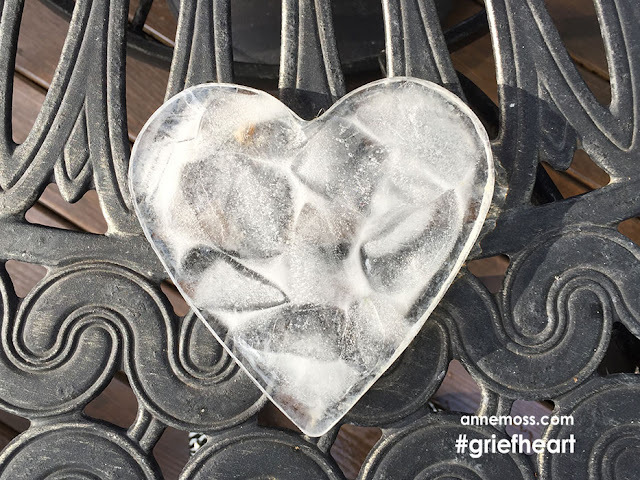 To give suicide loss survivors like me permission to remember a loved one that died by suicide. The #griefhearts represent the state of my heart in the grief journey, a memory of my son, honor another who died by suicide, show support from others or makes a point for the purpose of suicide awareness. Others are encouraged to be part of the project and I have published guidelines. It’s about all of us telling our stories and allowing us to share memories of our loved ones that died by suicide. This has never been encouraged. We are allowed to speak their names without whispering, share our memories without shame or judgment and honor our own grief journey. Learning to live without the person that was my purpose is probably the hardest part of my grief journey. 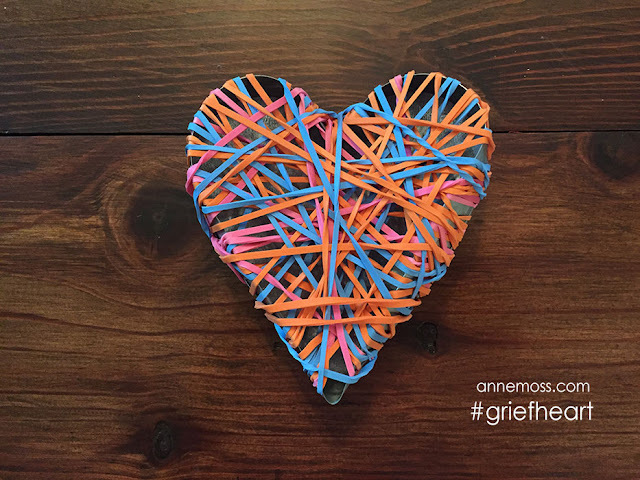 After my son died, my creativity did, too. I wanted a project that honored his memory, opened up conversation about suicide because it saves lives and rekindle my own creativity to remind me that I am alive and have a purpose. I saw Noah speak at a local event about his Skull-A-Day project and it hit me that day what I needed to do. How has doing a yearlong/daily project affected your life? I have discovered so many things about others and myself. I didn’t expect the outpouring of support. 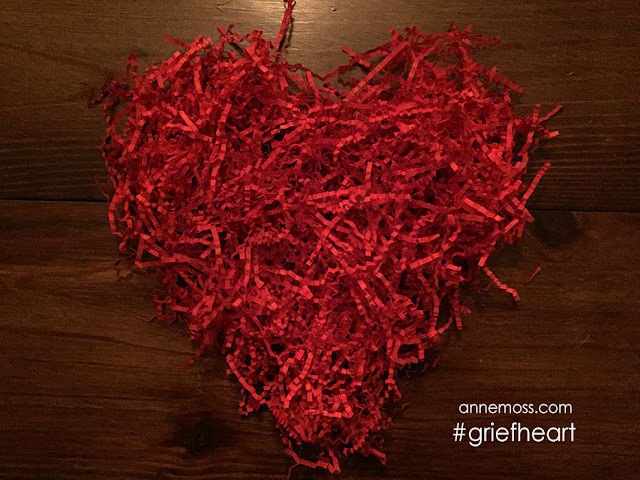 I didn’t expect that others would want to honor their loved ones with a #griefheart. I didn’t expect young adults to write me and thank me for bringing attention to a topic that is often swept under the rug and ignored. I have learned to accept help and support with grace. I have learned to accept that some days are good and some are still very hard. I have connected with others who have lost a loved one by suicide or otherwise. I have learned that I’m not always the captain of this journey. And yes, it has rekindled my creativity. But it’s done so much more than that. Since I started it, I have been able to complete a school program of suicide prevention for schools that is unlike any other out there. Piloting in Virginia soon. 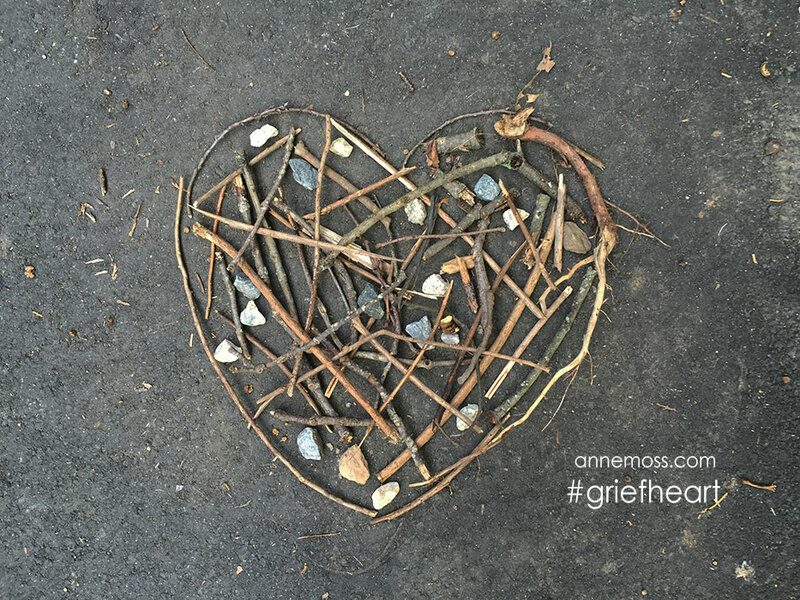 See all of Anne's #griefhearts HERE. 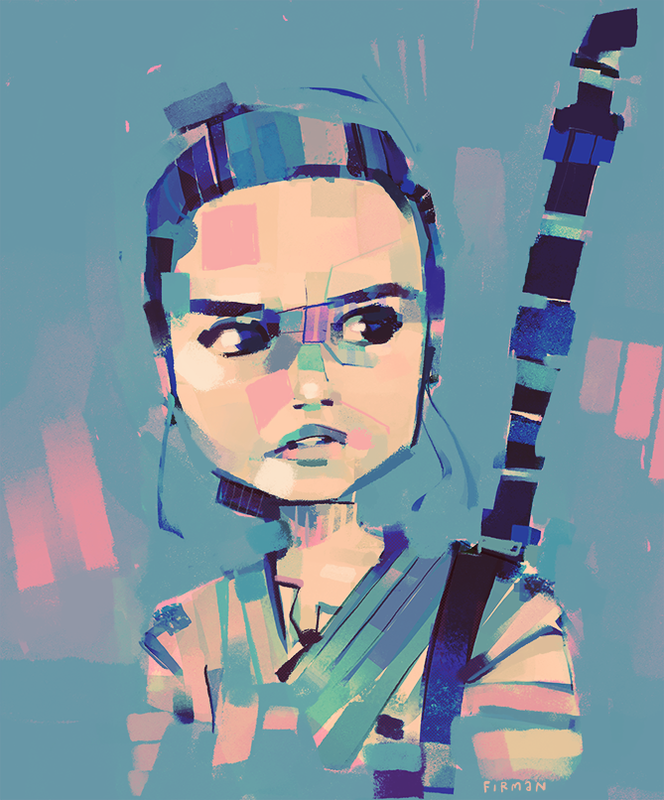 Michael Firman in Ontario, Canada is making an illustration of the character Rey from the movie Star Wars: The Force Awakens daily in his Rey-a-Day project! Why did you decide to do this project? 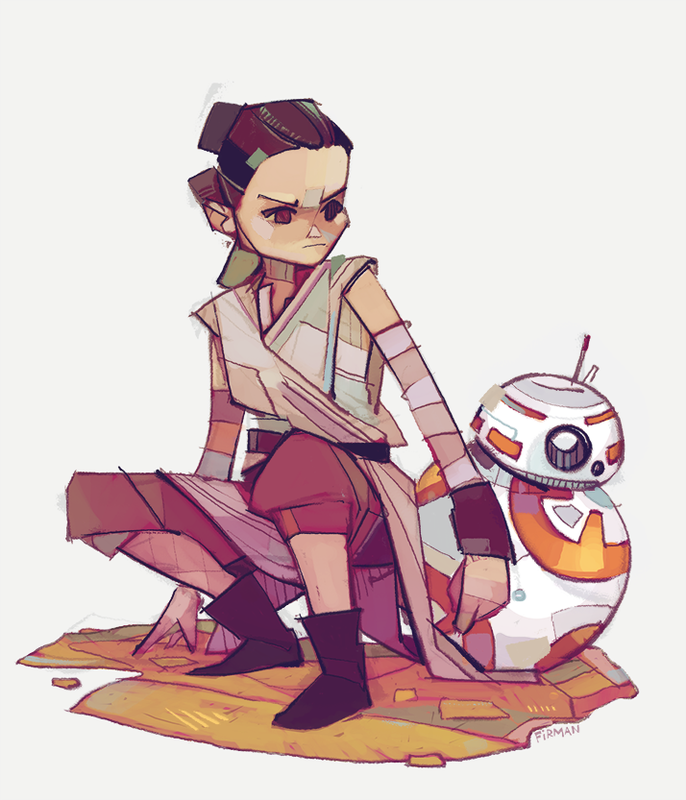 After watching the movie, and enjoying the new characters, I made Rey fanart. I wasn't happy with how it turned out, so I tried again the next day. This process is looping indefinitely. Committing to it as a project was whim and maintaining the commitment is a love of its absurdity. How has doing a project affected your life? 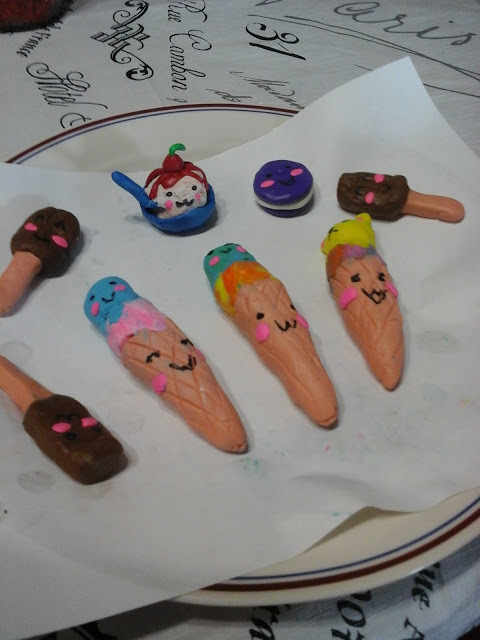 My art skills & self-discipline are improving. I'd considered myself in a 'slump' earlier this year, so besides technique, the daily routine is exercising my ability to produce and surrender something without freezing over flaws or how it will be received. The constraint of subject is forcing me to think in a creative and exploratory way to try to keep the days fresh. It's encouraging to hear from everyone entertained by the work, and I am grateful for having an audience! It's always interesting when people tell me which illustrations they most enjoy because there's such variety in the answers, and sometimes I'll post an image thinking, "Oh no, is this my worst one yet?" and someone will cheerily proclaim it as their new favourite. I don't mean to overemphasize outside attention though. Ultimately a daily project will develop character, personal value & creative liberation when it's made for the person making it. Don't worry about making something bad. Don't worry if they're all bad! Who cares! 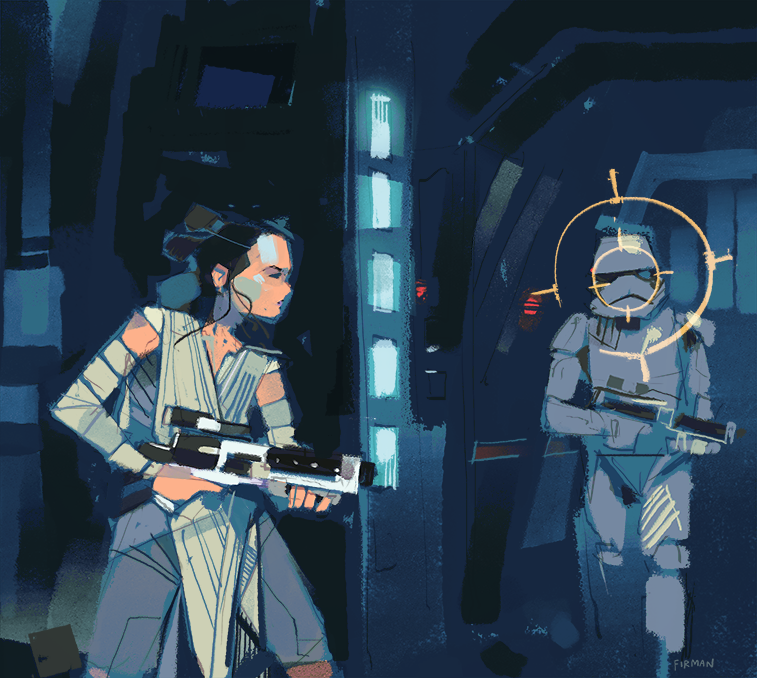 Even if it's not obvious progress when you look at your own work, you are learning something every time you try. Dailies expedite development. 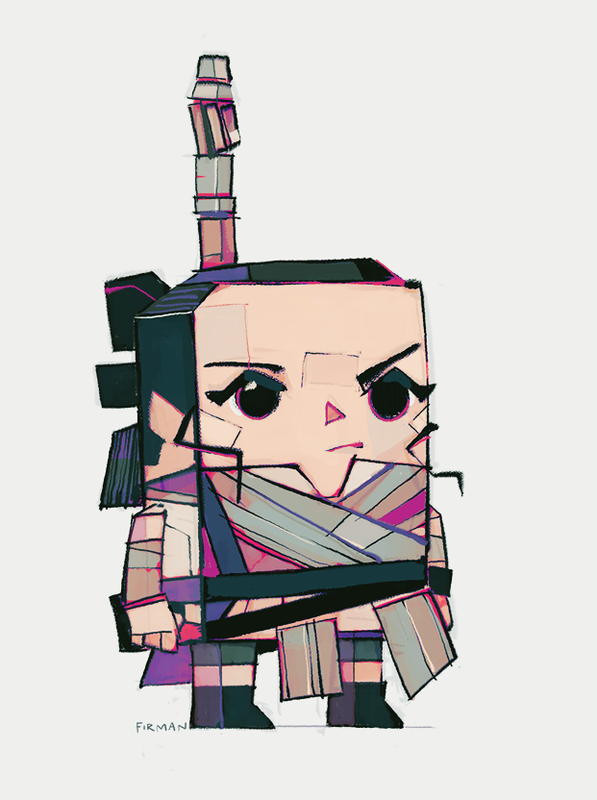 You can find all of Michael's Rey's on Twitter, Instagram, and Tumblr.